South Sudanese President Salva Kiir shakes hands with the Norwegian foreign minister Ine Marie Eriksen in Juba on 6 November, 2018. Photo: South Sudan Presidential Press Unit. South Sudan’s President Salva Kiir met at the State House in Juba with the Norwegian Foreign Minister Ine Marie Eriksen where they discussed the latest peace process. In a press statement after the meeting, South Sudan’s Foreign Minister Nhial Deng Nhial said President Kiir briefed the Norwegian Foreign Minister on the government’s plans to implement the revitalized peace agreement. He pointed out that the meeting also discussed ways to deepen and broaden the already great bilateral relationship between South Sudan and Norway. 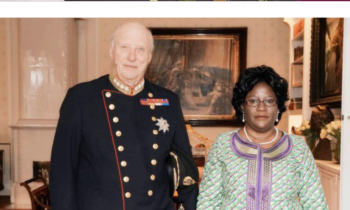 The South Sudanese diplomat called on Norway to support the peace process in South Sudan. For her part, Minister Ine Marie said her meeting with President Kiir was fruitful. 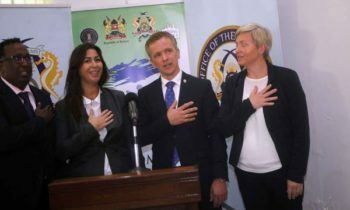 Marie reiterated the Norwegian government’s keenness to support the South Sudanese government in implementing the revitalized peace agreement. The peace deal signed by President Kiir and opposition leaders in September will see the creation of a new government, with main opposition leader Riek Machar reinstated as first vice president, one of five vice presidents.